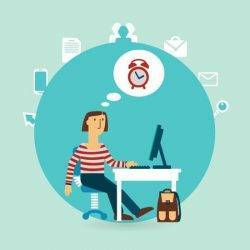 Available time seems shorter when it comes just before an appointment, say scientists who found that an upcoming task may make us less productive. In a series of eight studies, both in the lab and real life, researchers found that free time seems shorter to people when it comes before a task or appointment on their calendar. The study appears online in the Journal of Consumer Research. In an online study of 198 peopl were asked to imagine they had a friend coming over to visit in one hour and “you are all ready for your friend to come by.” The others were told that they had no plans for the evening. All participants were asked how many minutes “objectively” they could spend reading during the next hour and how many minutes they “subjectively” felt like they could spend reading during that same hour. When they were asked how much time they felt they had to read – the subjective measurement – those with a friend coming by felt that they had 10 more minutes missing in their hour – about 40 minutes. The results held up in real-life studies as well. The researchers asked participants recruited online to provide their actual schedules for the next day. Participants indicated when each scheduled task on their calendar would begin and how much time they would need before each task to prepare. Participants were then offered the opportunity to take part in either a 30-minute or a 45-minute study on that day. The 30-minute study paid $2.50 and the 45-minute study paid twice as much: $5. For some participants, the study was scheduled in the one hour before they said they had to start getting ready for their next appointment. The others were not scheduled up against another of their appointments. Even though they had plenty of time to finish the 45-minute study, participants who had an appointment in an hour were significantly more likely than the others to choose the 30-minute study instead of the 45-minute version. “It was clear they would have plenty of time to finish and have extra time before their next appointment, but they still were more likely to choose the 30-minute study – even when they had a clear financial incentive to choose the longer study,” Malkoc said. Others weren’t reminded about their upcoming task and were simply told “they had about five minutes to do whatever you want.” After the time had passed, all participants wrote down what they did during the five-minute interval. The students indicated they did things like sending a text message, checking email and visiting social media sites. But those who weren’t reminded they had an upcoming task performed more activities (an average of 2.38) than those who were told they had a task soon (an average of 1.86). These findings suggest that looming tasks on our calendar make us less productive, according to Malkoc. 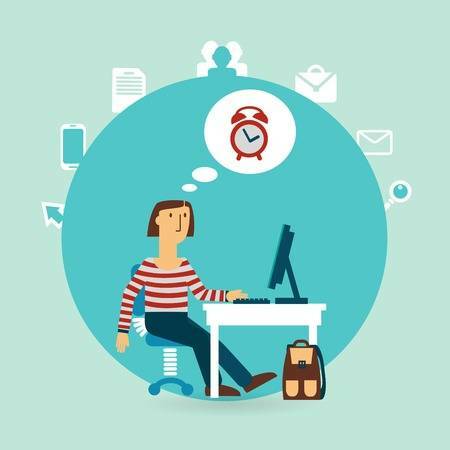 “You don’t feel like you can get as much done when you have a task coming up soon. The time seems shorter. We feel that if we have a meeting in two hours, we shouldn’t work on any big projects. So we may spend time just answering emails or doing things that aren’t as productive,” she said. That may explain why, on days when we have meetings spread throughout, we feel like we have accomplished little. The problem is that we aren’t maximising the time in between those meetings, she said. One solution, she said, is to try to stack all your meetings together. That way, you have longer, uninterrupted times when you feel you can tackle the bigger projects on your agenda. It is also good to remind yourself of how much time you really do have available. “We seem to overestimate the things that might happen to take up our time, so we don’t get things done,” Malkoc suggests.